Rotating Offsets (RO, ROP, ROL, ROX, ROB) enable camera operators to easily change camera position with the lockable rotating mechanism. All models feature a 360-degree range with 84 lock positions (every 4.28 degrees) and a leveling indicator. They are available in various length and height configurations. Manufactured from high-grade aluminum alloy with multiple lubricated bearings for smooth operation, these lightweight offsets have a standard Mitchell mount that attaches to all J.L. 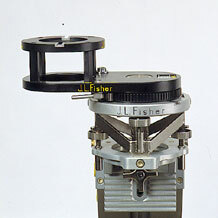 Fisher Dollies and Mitchell mount products. The Rotating Offset Pivot (ROP) has a 20-inch offset and 5.375-inch riser and is equipped with a standard Mitchell mount.